Day Care Trumbull: Two Under Two? Let Us Be Part of Your Village! Any parent of two children under two, or so close they might as well be, knows the battles of two little ones in diapers, of the whack-a-mole nap times, of the fatigue of having them pass a cold back and forth leading to weeks of nights of little sleep. We know it’s a struggle and it takes organization and help from all sides to get through this stage. Here are two tips for surviving this stage of parenthood. Some days, it’s hard to remember that your toddler is still a baby. It can be easy to turn them into your little helper and expect them to act much older than they are. Remind yourself that they are still tiny. They are not the only ones with expectations being forced on them. Be kind to yourself as well. You’ve probably never done this before, so cut yourself some slack. Having two under two is a handful on the best days, and it’s ok to ask for help so you can take some me time to go to the gym, get a massage, or take a nap. The saying about it taking a village to raise a child is doubly true when it comes to moms and dads with two babies under two years old. Strong Start can help! We offer care starting at eight weeks and have specific programs for infants, toddlers, and preschoolers. We also offer Flex Care so if you need to have half days, a few days a week, or irregular drop-off times, we can accommodate your family’s needs. We are proud to be part of the village of the Trumbull / Bridgeport area and help many families. 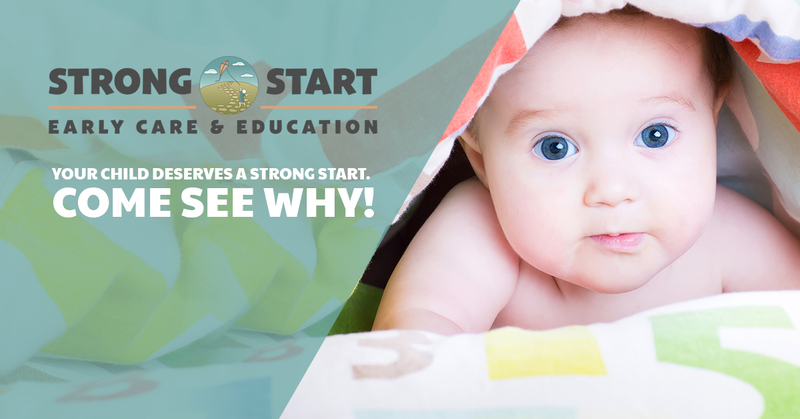 Strong Start offers a great curriculum in a safe and secure place where they can play, grow, and make friends. Call us today to schedule a tour of our day care.